Have you ever heard of the ‘rule of three’? The theory goes that a trio of things are funnier, more satisfying and more effective than other numbers. 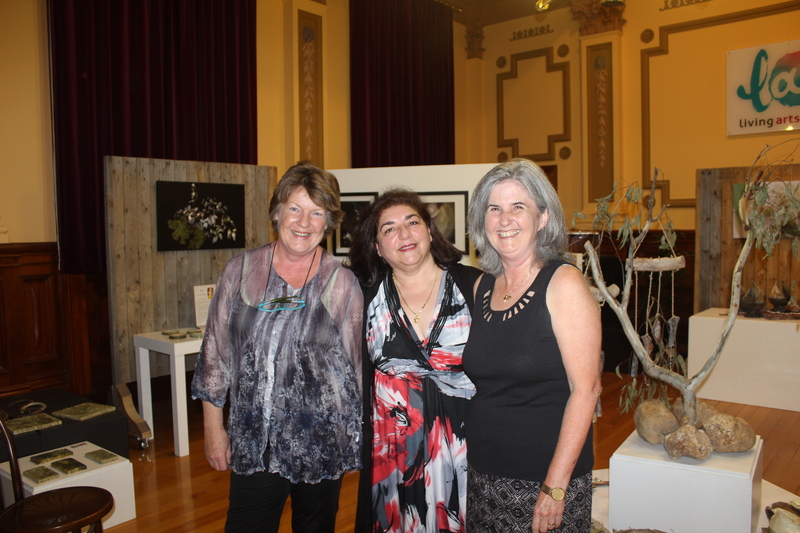 Cue artists Lyn Cole, Mari B-Li Donni and Sharon Greenaway. Eighteen months ago the La Trobe alumni formed the group 3 AMPS, meaning three artists, three methods, three practices. This month, they launch their first group exhibition at the coveted, and oh-so-classy, Living Arts Space in the old post office, central Bendigo. “It’s a beautiful room and it means we’re guaranteed to have our work seen because there are people coming through here all the time,” Sharon says of the space adjoining the Bendigo Visitor Information Centre. Turns out there’s strength in threes, too. Mari says she’s spent much of her 20 years in Bendigo networking. Getting to know other artists and professionals. When 3 AMPS went searching for a space for its first show, Mari called on contact Lauretta Zilles, Living Arts Space curator. “You really only get one chance to be here because there’s such a lot of artists wanting to be in this space,” Sharon says. This show is the result of a year of collaboration and work. Titled The Transient Landscape, a love of Bendigo, its natural and built heritage, tie the pieces together. Look closely at Lyn Cole’s ceramic cups. Each one different, each one hand-stamped with vintage lithograph symbols and letters, honouring Bendigo. “It’s everywhere in Bendigo, these little patterns and details,” Lyn says, pointing out the heritage mouldings on the gallery walls. 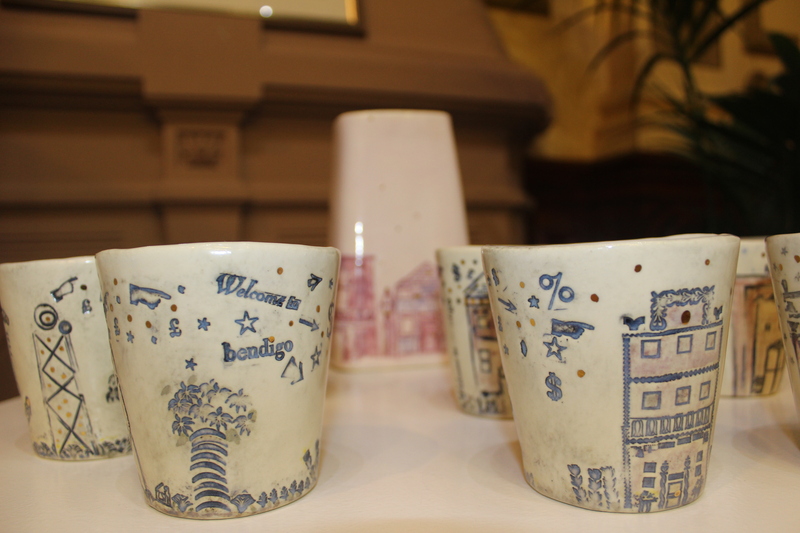 Lyn has stamped scenes on the cups, depicting the flow of wealth from underground to Bendigo’s grand old streets. Her work also includes ceramic vessels hand-painted with local scenes and highlighted with 22-carat gold. They’re beautiful. Gold is a theme in Sharon’s work, too. Metallic paper petals of everlasting daisies, soft gum and wattle blooms and bees on sunflowers focus on nature’s treasures. Concertina books and poetry highlight Sharon’s love of the bush. She obtained a permit to collect specimens for her images, paper bowls and potpourri. She’s also taken what she learnt in the La Trobe dark room and applied it to digital art, hand-colouring photograms with pastels for a creamy, dreamy, feathery feel. 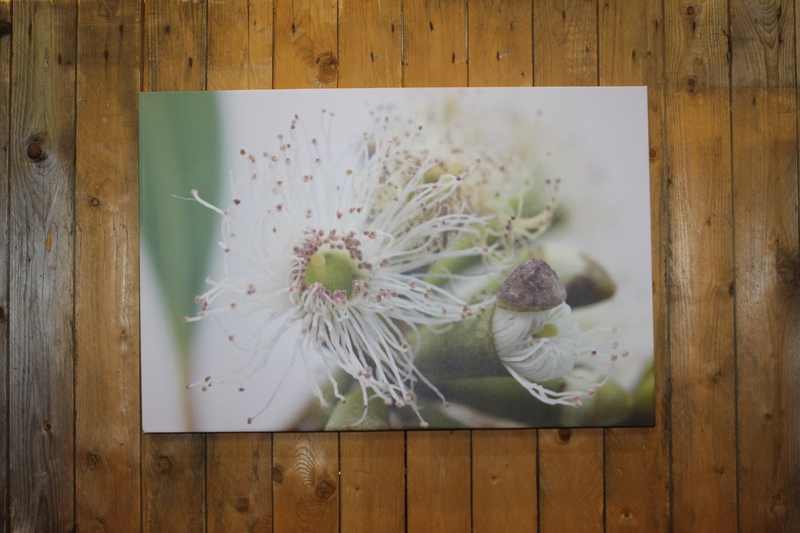 Some of Mari’s work looks below Bendigo’s heritage veneer. The installation Of Gold, Will and Power is a nod to the 1800s gold rush and “the will of the people to persevere through struggles and hardships and the power of the hierarchy who control the town,” Mari says. 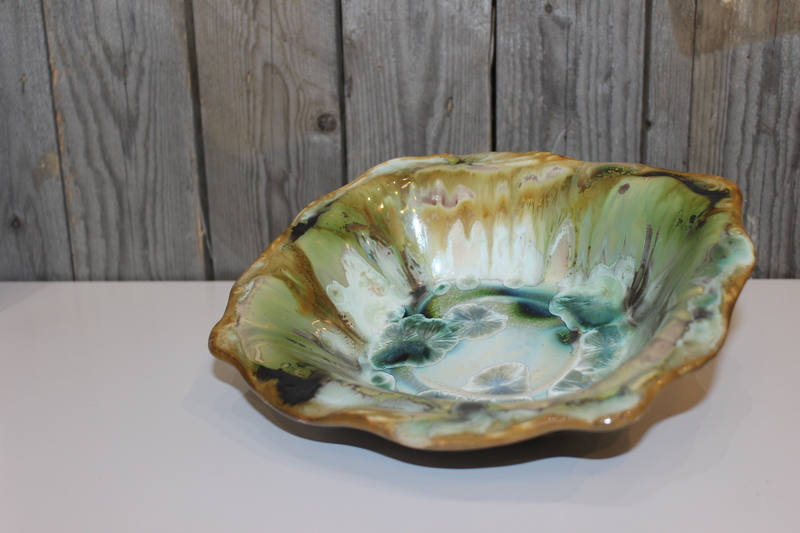 Other pieces, such as this beautiful bowl, highlight her skill as an artist and the colours of our landscape. The trio all agree they’ve found inspiration and focus through working together. “You’ve always got to have a project to work towards. It keeps your creativity alive, it keeps that light burning,” Lyn says. These artists represent over 15 years of creative arts education at the Bendigo campus. Mari graduated in 2002, Sharon in 2011 and Lyn in 2013. The women have called on La Trobe visual arts lecturer Anthony Conway to open The Transient Landscape at 2pm Saturday, April 30 at the Living Arts Space in the old post office, Pall Mall. The works will be on show and on sale until August 7, 2016. My pleasure Sharon. Best wishes for your beautiful exhibition.